It is so cute when kids are learning how to read. They are becoming so independent. Soon they won't need you to read things for them, they can read stuff to you! 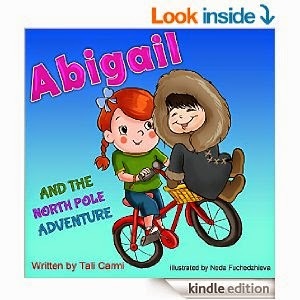 Abigail and the North Pole Adventure, is a good book for any child that has a bit of a grip on reading. The words are easy enough for them to sound out on their own. They may not understand everything they are reading about though. That is the good part about reading with your kids and listening to them read to you. After the story is over, or during the story, you can talk about and discuss the different things your child doesn't understand. Abigail, is a normal child. She has a very active imagination that takes her all over the world. it starts when her grandparents bring her a new bike. She then heads to all sorts of places. The place that this book centers around is the North Pole. Abigail, literally runs into an igloo. She then meets a boy and finds out all about the North Pole and how they survive there. She even ends up helping a stranded polar bear get back to land. Abigail, ends up with some cool gloves from her adventure. She tells her grandparents about it. Her grandma thinks that she came up with a cool story from her imagination but her grandpa knows the truth. Always let your child have an imagination. It lets them do all sorts of interesting things that don't cost you a penny. There is no limit to what they can think up and do. I always let my kids use their imaginations and somedays they can play for hours. It was really nice listening to my step daughter read this book to us. She did really well, and may not be up to speed with all the words, but she sounded them out nicely. Her and the other kids really loved the story and they started thinking up more adventures and more places that Abigail could visit. You will enjoy this book and so will your kids. Head on over to the product page on Amazon. From there, you can find out more about the book and author, see what other people are saying about this book, and buy it for yourself and your kids. I receive this product for free in exchange for my honest opinion and review.